Strategic nonviolent action has reasserted itself as a potent force in shaping public debate and forcing political change. Whether it is an explosive surge of protest calling for racial justice in the United States, a demand for democratic reform in Hong Kong or Mexico, a wave of uprisings against dictatorship in the Middle East, or a tent city on Wall Street that spreads throughout the country, when mass movements erupt onto our television screens, the media portrays them as being as spontaneous and unpredictable. 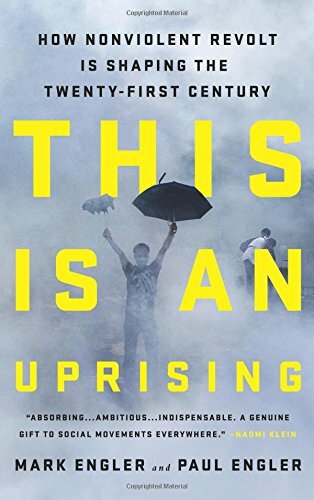 In This is an Uprising, political analysts Mark and Paul Engler uncover the organization and well-planned strategies behind such outbursts of protest, examining core principles that have been used to spark and guide moments of transformative unrest. This is an Uprising traces the evolution of civil resistance, providing new insights into the contributions of early experimenters such as Mohandas Gandhi and Martin Luther King Jr., groundbreaking theorists such as Gene Sharp and Frances Fox Piven, and contemporary practitioners who have toppled repressive regimes in countries such as South Africa, Serbia, and Egypt. Drawing from discussions with activists now working to defend human rights, challenge corporate corruption, and combat climate change, the Englers show how people with few resources and little influence in conventional politics can nevertheless engineer momentous upheavals. Although it continues to prove its importance in political life, the strategic use of nonviolent action is poorly understood. Nonviolence is usually studied as a philosophy or moral code, rather than as a method of political conflict, disruption, and escalation. This is an Uprising corrects this oversight. It argues that if we are always taken by surprise by dramatic outbreaks of revolt, and if we decline to incorporate them into our view of how societies progress, then we pass up the chance to fully grasp a critical phenomenon—and to harness its power to create lasting change.